His bundle pacing was successful in 92% of patients and the primary endpoint of death, heart failure hospitalisation or upgrade to biventricular pacing was significantly reduced in the His bundle pacing group. Right ventricular pacing is associated with heart failure and increased mortality; His bundle pacing is an alternative. A two-centre study compared the clinical outcomes of His bundle pacing to right ventricular pacing. Consecutive patients referred to Geisinger Wyoming Valley Medical Center, Wilkes-Barre, USA and Geisinger Medical Center, Danville, USA from October 2013 to December 2016 for permanent pacemaker implantation for standard indications were included, totalling 765 patients. 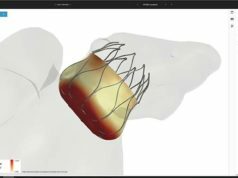 The study, published in the Journal of the American College of Cardiology, concluded that permanent His bundle pacing was feasible and safe in a large real-world population requiring permanent pacemakers. His bundle pacing was associated with reduction in the combined endpoint of death, heart failure hospitalisation or upgrade to biventricular pacing compared to right ventricular pacing in patients requiring permanent pacemakers. His bundle pacing was attempted in 332 consecutive patients while 433 patients underwent right ventricular pacing. The mean age was 75.7±11 years with males accounting for 55.8% of the study cohort. Prior history of heart failure and atrial fibrillation was present in 28.8% and 50%, respectively. Mean baseline left ventricular ejection fraction of the entire cohort was 54.5±9.5% and mean QRS duration was 108±27ms. Indication for pacemaker implantation was sinus node dysfunction and atrioventricular conduction disease (35% vs. 65%, respectively). Patients were considered as lost to follow up if they didn’t have an event and were not seen in the Geisinger Health system in 2017. In the His bundle patient group 16 (4.8%) patients were lost to follow-up compared to 15 (3.5%) in the right ventricular patient group. The mean follow-up duration for the entire cohort was 725±423 days. The median follow-up in the right ventricular pacing group was 648 days compared to 754 days in the His bundle pacing group (p = 0.01). Demographics were similar in the His bundle pacing and the right ventricular pacing groups, except for higher prevalence of males (60% vs. 52%, p<0.05) and atrial fibrillation (57% vs. 45%, p<0.05) in the His bundle pacing group. Mean baseline QRS duration was slightly longer in the right ventricular pacing group compared to His bundle pacing (110±28 vs. 105±25 ms, p<0.01). The results of the study show that permanent His bundle pacing is associated with a significant reduction in the primary endpoint of all-cause mortality or heart failure hospitalisation or upgrade to biventricular pacing as compared to conventional right ventricular pacing in patients undergoing permanent pacemaker implantation for bradycardia. The primary outcome was driven by a significant reduction in the incidence of heart failure hospitalisations associated with His bundle pacing. Additionally, the significant reduction in the primary endpoint was entirely due to the differences in the outcomes for patients with greater than 20% ventricular pacing burden. These findings address the need to determine the best ventricular pacing site in patients requiring permanent pacemakers for bradycardia therapy. This study is supportive of the concept that His bundle pacing can prevent ventricular dyssynchrony by facilitating conduction through the native His-Purkinje system.